When you’ve mastered hunting in the daylight, nighttime hunting or scouting is the natural next step. Many animals are more active and abundant during the night hours, allowing you to have a greater or entirely different set of prey. You can also extend your hunting hours and season easily by utilizing time after dark. 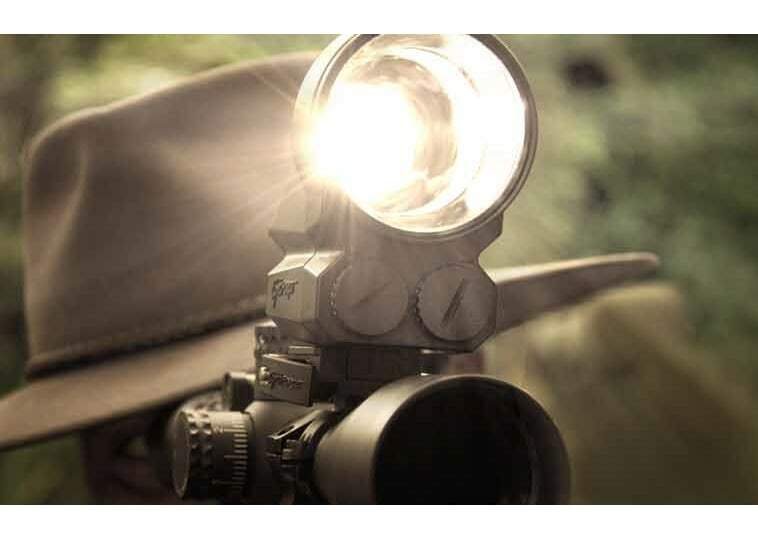 In order to hunt effectively at night, you’ll need some specialized gear to help you see your surroundings, the most important of which is a good spotlight. How is the Brightness of a Spotlight Rated? In most cases, the brightness of a spotlight is rated in Lumens or Candela. Lumens are more straightforward and are probably more useful to the average hunter. The luminous flux (measured in lumens) is used to quantify the amount of useful light emitted from a light source. Comparing the lumens of different bulbs compares the estimated apparent amount of light produced by the bulb, so a light bulb with a higher rate of luminous flux to consumed power is more efficient. The actual brightness of a bulb cannot be accurately measured as it is a subjective perception impacted by the distance from the light source and angular speed of light. The candela measurement is used to decipher the luminous power of a light source at a solid angle in a particular direction. For context, an average wax candle burns at a “brightness” of about one candela. The higher the number, the more luminous power. Other than the power source, mounting type, and bulb color, here are three factors to consider before investing in a quality spotlight. A good spotlight is made to last a long time, despite the rugged conditions hunting requires. Make sure your spotlight is made from quality materials, inside and out. The type of bulb should be included in this decision, as well as the make of the outside. If it rains a lot in your area, making sure your device is waterproof is a must, and if you plan on night hunting in cold weather, this also must be accounted for when ensuring the longevity of your spotlight. The size and weight of your spotlight matters, not only relative to a vehicle you plan to affix it to, but also if you are looking to carry it long distances. The weight of a handheld must be compatible with your size and the weight of the rest of your pack. The color of your bulb is important to factor in, as well as the lumen and candela measurement. Depending on your perspective use including which prey and how far away from the target you like to hunt, the distance your light source travels is essential to account for. It is also advisable to match the bulb color with your hunting style and with the animals you hunt! With so many features to consider, and many options to choose from, finding the best spotlight for you might seem daunting. To help you out, here are five of the best choices of hunting spotlights with their main features, pros and cons, and detailed characteristics for comparison. 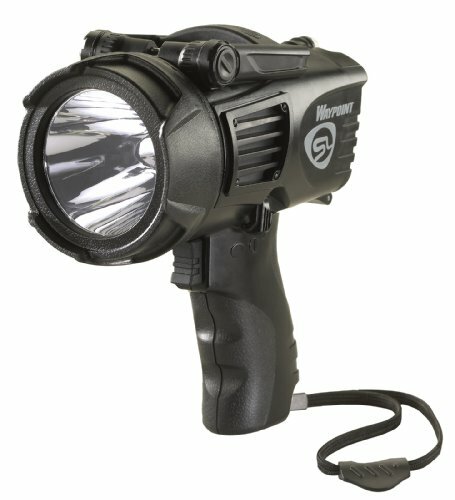 The Streamlight 44905 Waypoint Pistol-Grip Spotlight is an amazingly powerful handheld device that is both battery and 12V cord compatible. This gives it the flexibility of being used in conjunction with a vehicle, or on a solo trip. Mobile and easy to use, it weighs only 1.8 pounds and is 6.8 x 7.1 x 3.5 inches in size. Big enough to do the job, but small enough to carry, this spotlight is comfortable to use while remaining powerful. It features three lighting modes to highlight its powerful LEDs including high, low, and emergency signal for safety. On high, it measures 550 lumens and 100 thousand candelas with a 625m beam distance. On low, it produces 40 lumens, 7.9 thousand candelas and has a 178m beam distance. Powered by four included “C” alkaline batteries or a 12V DC power cord, it has an 8.5-hour average battery life. The design combats hand fatigue with a cushioned handle as well as a built-in stand for moments of rest. Engineered for durability, this spotlight was designed with high-impact polycarbonate housing and an unbreakable polycarbonate lens that is O-ring sealed and includes a rubberized lens ring. It is not only IPX4 water-resistant certified, but has been one-meter impact resistance tested. This is the best overall spotlight for hunting. It is comfortable to hold, engineered to endure any weather or turbulence in the field, and has a solid battery life and range of vision. It is compatible with both rechargeable batteries and 12V cords, making it great for anyone who finds themselves using both a vehicle and traveling by foot. 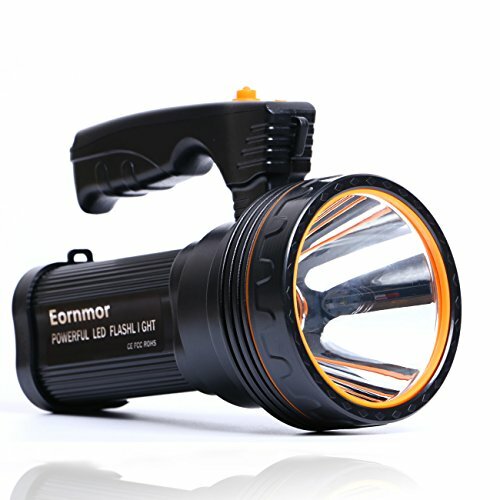 The Eornmor Outdoor Handheld Flashlight is the brightest hunting spotlight. 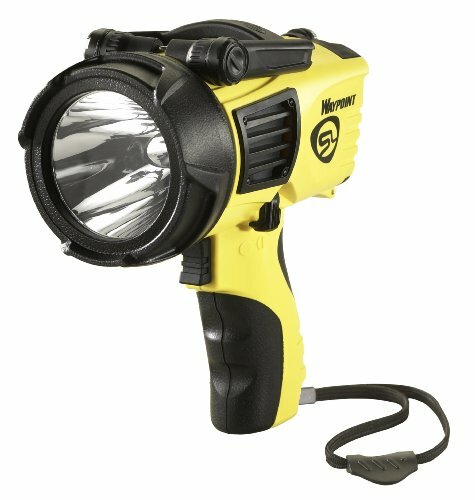 It is handheld, and features two brightness levels with an incredible illumination range of 2600 feet with its six-thousand lumens. Perfect for people covering big stretches of land, or anyone looking to shoot from particularly far away, this spotlight has an unbeatable range of vision. Powerfully bright and lightweight, this 14-ounce handheld light is ideal for traveling or carrying. It has a large and comfortable hammer as well as a hand strip perfect for toting for any distance, and only measures 7.7 x 3.9 x 4.7 inches, so it can be transported most places. With a rechargeable lithium-ion battery (via USB) featuring capacity up to 9000mAh, this spotlight will not only last a long time before needing to be recharged, but can also be used as an emergency power bank for things like smartphones or other mobile devices. The life of the white LED lasts over 100-thousand hours, and the overall battery span is 15-25 hours, making this perfect for week-long trips. Good for use in any weather, this device comes with protection against splashing water from all angles. It is rated waterproof, though should not be submerged for long periods of time. This spotlight is durable and effective, with a huge range of vision while remaining lightweight, and provides all the necessary elements of a good handheld flashlight. This hunting spotlight is lightweight and water-resistant, making it ideal for travel. 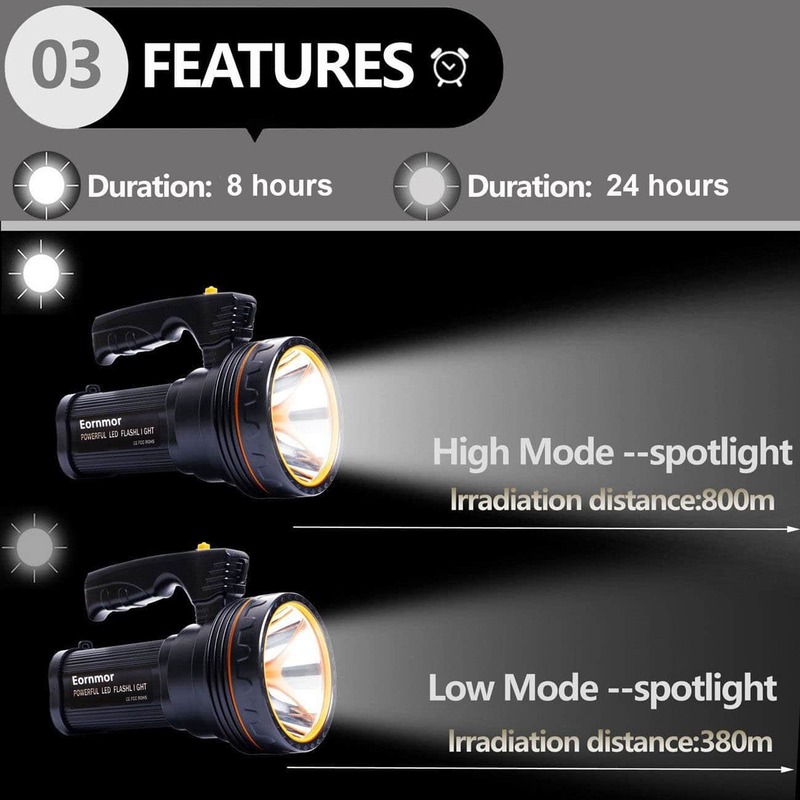 It has an incredibly long battery life of 25 hours and enormous 2600-foot illumination range, making it one of the brightest options available without compromising weight or effectiveness. The best handheld spotlight is the Streamlight 44910 Waypoint Spotlight. Engineered to combat hand fatigue, this pistol grip light comes with a stand for still moments. Powered by a rechargeable lithium-ion battery, this option is ready to travel with you on foot. The 120-volt AC charger comes with a digital on-board safety control circuit to prevent overcharge, helping you extend the lifespan of your battery and has a run time of between 3 and 60 hours. The light itself produces 1000 lumens on high, 550 on medium, and 35 on low, and exhibits an amazing 50 thousand hour lifetime. Its field of vision is up to 678 meters and weighs only 1.5 pounds, so it can travel with you. This spotlight was built for tough conditions as it features a shell of durable polycarbonate and an O-ring sealed lens as well as a rubberized lens ring. It is IPX8 rated waterproof up to two meters, and is one-meter impact resistant. This amazing set up also floats if dropped in water for easy recovery. Perfect for harsh or demanding conditions, this spotlight is dependable in any weather. 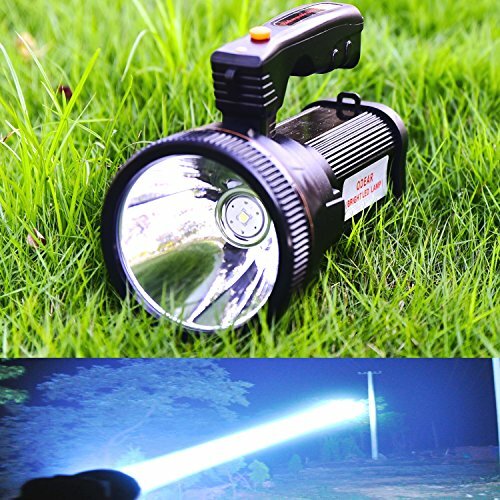 This is a great spotlight option for hunters that face harsh elements in the field. It is extremely durable, featuring water and shockproof technology, and even floats if dropped in water. Comfortable to hold over long periods of time, this light has pistol grip comfort and a battery that lasts up to 60 hours with built-in features to protect its lifespan. 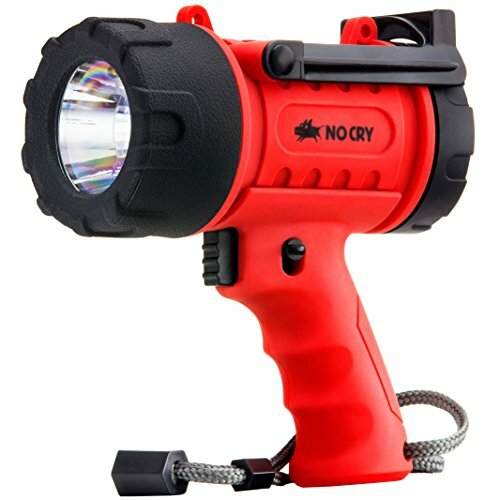 The amazing NoCry Waterproof Spotlight is the best rechargeable option for hunting. It features a powerful 7.4-volt, 18,500 lithium-ion battery that can hold a charge for up to 20 hours of use. This spotlight uses super-bright 18-watt LED lights with three brightness settings from 100-1,000 lumens, and has a removable light filter, allowing hunters to choose between white and red lighting settings. This expands the types of game that can be hunted, and puts you in control. Perfect for travel, it not only features a long lasting battery but is light and small. Made to pack in a bag or trek with you out on the trails, this handheld light weighs less than a pound (15 ounces) and measures only six inches long and three inches wide. It is perfect for carrying over long distances, and you won’t get tired of using it. It also comes with an adjustable stand for hands-free use in moments of rest or stagnancy. This powerful piece is not only dependable, but is built to last. Engineered from sturdy and impact-resistant ABS and polystyrene to protect the inner system from scratches, breaks, and all other damage in the field. It also is waterproof for use in heavy rains and even floats if dropped in water. This spotlight is perfect for travel of any kind, featuring a compact and lightweight design. It has a durable shell to protect itself from the elements, and is waterproof as well as flotation engineered. With 20 hours of battery life, it is a good travel companion, and is versatile as it offers both red and white light. This spotlight is an amazing option for anyone looking for quality performance without breaking the bank. It uses CREE high power lamp beads with professional level spotlights and high brightness LED searchlights that produce up to 6000 lumens. With a vision distance of 2600 feet and long-spotlight option, you won’t miss a thing. It features a high-capacity lithium battery (9800 mAh) that can provide up to 16 hours of lighting. It also has current protection mode to ensure a long battery life, and protects against overcharge. It can be wall charged or charged by USB cable by five ports, which can be used as a power bank for a mobile device in an emergency. The ASB-engineered plastic is built to last and is rated explosion proof, waterproof, dustproof, moisture proof, and impact-resistant. This sturdy device is also lightweight and compact, weighing under one pound which makes it the perfect traveling partner. Easy to hold by hand and for transport, this piece can also be affixed to weaponry for your ease of use. This spotlight provides amazing quality at an equally amazing price. With 6000 lumens, it is more powerful than many more expensive options. It offers 2600 feet of vision and 16 hours of lighting with safety features to discourage overcharge. It is water, dust, and impact proof, and can be both handheld or affixed to a surface for your convenience. Below are three general ways average spotlights differ from one another. The best option for you will be determined by the type of hunting you typically do. There are two main power sources for spotlights: wired and battery powered. Wired spotlights are connected to a 12 V power source via cigarette adapter, and eliminate the need for batteries. While allowing for this waste-free lifestyle, spotlights powered in this way have limited mobility. These spotlights must be connected constantly to a vehicle, boat, ATV, or other similar apparatus with a 12V direct current, and because typical cords for this are no longer than ten feet, they greatly limit the range of motion. In contrast, spotlights with rechargeable batteries are great for mobility, allowing hunters to move as they please. Because they generally are sourced from a lithium-ion battery, they function for a short span of two-three hours before needing to be recharged (for up to four hours). For those who travel both on foot and vehicle, and hunt for long and short periods of time, some spotlights are compatible with 12V sources and rechargeable batteries, but many only feature one option. Many hunters opt for a handheld spotlight, as it allows for flexibility and mobility, but only works if you have a free hand to operate it with. A good handheld device should be lightweight, weatherproof, have a no-slip grip, and feature a locking option that will ensure the light remains on without needing to press the switch constantly. The other choice is a mounted spotlight, which is most compatible with those using a vehicle. Whether permanently screwed in or magnetically mounted for flexibility, a good, mounted spotlight will feature tilt or rotation allowing for adjustments. Differently colored bulbs are favored for hunting different animals. Red is typically favored for coyotes and wild hogs, and is less startling to many types of prey than a white light. It also cannot be seen at all by many animals, although it does not typically travel as far as some other colors. Green is usually used for feral hogs, coyotes, and foxes. It appears brighter and further reaching than red, and can only be seen by animals when directly in front of them, so if you like to shoot from the side, this color is for you. When seen, however, it appears brighter to animals then red. White beams are uncommon for predator hunting because of its intense brightness and interference with stealth. Some use the “halo” method with this bulb, but it is generally unpopular. Infrared is thought to be the best option by many, as it is colorless and invisible to the naked eye of humans or other animals. While impossible to detect, it does require extra night vision equipment. Hunting at night expands your available hours but also the type of prey you can find. After mastering daytime on the trails, night hunting is an amazing next step, but is impossible without a good spotlight. Spotlights come in many different designs and styles, and prioritize different features. Some are extra bright, good for extremely forested or large areas, while others hold more battery charge or are lightweight making them a good choice for week-long trips. Although they are all uniquely adorned with various technology, there is a perfect choice for everyone depending on their situation.